A large number of festivals and fairs are celebrated in Odisha (Orissa). These differ from tribe to tribe, from caste to caste and also from region to region. Dandanata is derived from 'Danda' a pole and 'mata' a dance which is performed in a fair called 'Danda Jatra'. This is celebrated in the month of Vaishaka (April-May). This fair is celebrated through dance, song and physical feats and the pole represents of Lord Shiva. The devotees are called 'Bhokta' and there are thirteen in a 'Danda' party. The leader is 'Pata Bhokta' , who leads a life of abstinence for twenty-one days prior to this festival. The Bhoktas move from village to village and perform at a house only when invited. The Bhoktas roll on the hot sand in the mid-day sun of summer, dance, and sing praying for the welfare of house holder. Whether someone in the family is childless or poor or suffering from some incurable diseases, the householder usually vows to become a 'Bhokta' next time if his miseries are removed. The austerities and physical sufferings include walking on fire, piercing the back with sharp nails, using poisonous snakes as garlands and making them sting the body, piercing the tongue or walking on a sharp sword edge etc, apart from fasting and abstinence. These are aimed in order to please and secure booms from Lord Shiva. Variations of 'Danda Jatra" are found in almost the whole of Odisha (Orissa) one variation is Jhamu Jatra or Nian Patua consisting of walking on a trench of fire, and the another one is 'Uda Jatra" or Uda Patna in which the devotees are hooked from their back muscles and are swung high round a pole. This fair is celebrated for twenty-one days in the month of 'Jaishtha' (May-June). When a smaller replica of Lord Jagannath is taken to the sacred tank for boating after being smeared with 'chandan' or sandal wood paste. This is aimed at providing cool comfort and relief from the summer heat. This is celebrated at places where there is a Jagannath temple and a lot of merriment goes with it when pilgrims congregate. 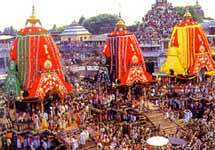 The main centre of this fair is at Puri, the celebrated 'shrikhetra'; the original seat of Lord Jagannath. The fair at Chandrabhaga begins on the seventh day of the bright fortnight in the lunar month of Magha (January-February) and continues for seven days. It is held at the mouth of sacred Chandrabhaga river near the famous temple of Konarka. This sacred site figures in the myth of shamba of the Mahabharata days who was cured of his leprosy by worshipping Lord Surya, the Sun God. The Sun Temple of Konarka and the sacred site refer to the prevalence of a strong solar cult in the coastal Odisha (Orissa). It is believed that whoever takes a bath in the Chandrabhaga will be cured of leprosy and bareness. Magh Saptami mela is observed at the same time at the Join centre of Khandagiri, near Bhubaneswer, for seven days.